LiveU IP bonding video transmission units - Rio 2016 Brazil. 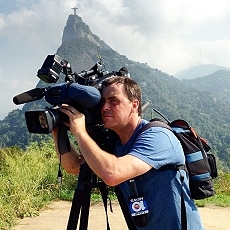 Hackensack, N.J., March 2016: As the world prepares for the 2016 Olympic Games in Rio de Janeiro, LiveU continues to be the preferred provider of IP-based live video transmission solutions for broadcasters and online streaming customers around the globe. LiveU’s industry-leading bonded cellular technology for live video acquisition, management and distribution is especially well-suited to provide solutions for the challenging environments, bandwidth options and multiple venues presented by the Rio Olympics. LiveU anticipates that an unprecedented number of IP-bonding units, more than 300, will be used by over 80 international broadcasters to deliver all the live action of the Olympics to their audiences. Broadcasters and online streamers are expected to generate an estimated 15,000+ live video sessions with potentially more than 50 TB of data to be transmitted during the course of the Games. Building upon the success achieved during the FIFA World Cup 2014™, where LiveU’s robust IP-bonding units were able to maintain uplink speeds in excess of 8Mbps in transmission from 12 varied locations throughout the country, LiveU will deploy even more technology, onsite venue support and services in Brazil this summer than have been in place for a live sporting event. LiveU’s entire portfolio of uplink solutions will be deployed, including backpack and camera-mount IP-bonding devices, such as the award-winning LU500 and the lightweight LU200, as well as the LU-Smart mobile application and the signal-boosting Xtender external antenna. LiveU’s cloud-based MultiPoint distribution service, which integrates seamlessly into the LiveU Central management platform, will enable customers to simultaneously share live feeds with up to 100 concurrent destinations worldwide. For added enhancement, LiveU will also offer multiple, dedicated Wi-Fi hotspot locations and a special integrated KA-Band satellite solution that includes a VSAT terminal, VSAT antenna with universal mount, WiFi router, and all cables and connectors. LiveU’s support team and its local partner, UCAN Digital Transmission, will be onsite in numerous venues, offering onsite 24/7 support in multiple languages throughout the Games to ensure all customers can deliver the best possible coverage during all events. During the past six years, LiveU has supported hundreds of customers in their coverage of many of the world’s most popular sporting events, including five Olympic Games, six NFL Super Bowl games, two FIFA World Cup™ tournaments, and many other international sporting events.